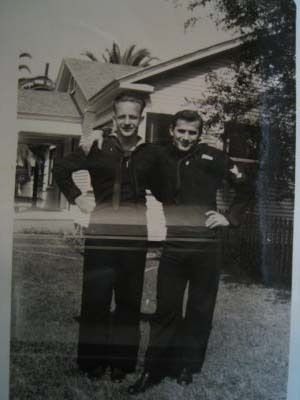 My father, Mitchell Cieliesz, S2C, service no. 944-20-33, was born in Detroit, Michigan, 5-20-1919. 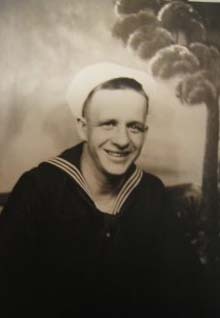 He entered active naval service on March 16, 1944, taking basic training at the Naval Training Station in Farragut, Idaho. 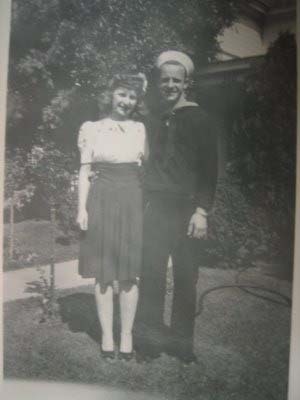 After Basic, he was assigned to the USS West Virginia on June 4, 1944, in Bremerton, Washington. On July 4, 1944, repairs and rebuilding were completed from the Pearl Harbor attack in 1941. She was ready for her trial run in Puget Sound. During the shakedown cruise off California, he sustained a knee injury and was transferred off the ship on July 21, 1944. Surgery was performed at the Naval hospital in Long Beach, CA, on July 22, 1944. He was then assigned to the hospital in San Bernardino, CA, for rehab. The rehab was completed in Dec, 1944, and arrived in Pearl Harbor on Jan. 3, 1945. 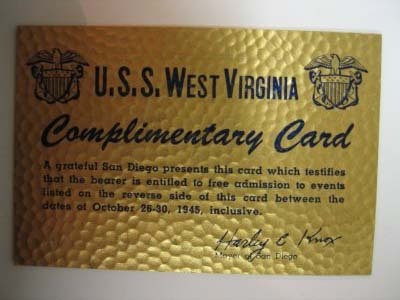 From there, he was aboard several different ships, finally catching up to the West Virginia on March 9, 1945. 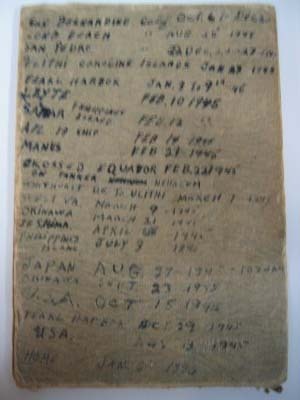 Since diaries and log books were prohibited aboard ship, he kept a record of dates and places on the inside of the cardboard backing on the picture he had of my mother. According to his notes, the West Virginia arrived in Okinawa on March 21, 1945. As the battle for Okinawa began on March 26, the West Virginia bombarded the shores, providing support for the Marines, who were headed ashore. 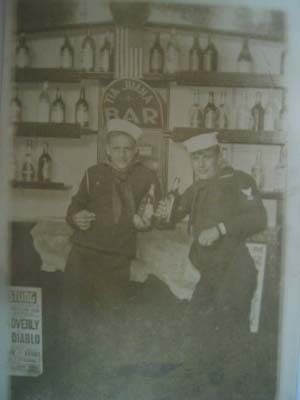 Dad didn't find out till much later that his brother, Daniel Cieliesz, was one of those Marines. On April 1, 1945, the West Virginia was struck by a kamikaze plane. All he ever told me was that the fire was quickly put out. He was also at the battle of Iwo Jima on April 25, 1945. The West Virginia then joined the Third Fleet and entered Sagami Bay, Japan, as part of the advance occupation force, on August 27. They entered Tokyo Bay on Sep. 1, 1945, where the surrender was later signed aboard the USS Missouri. With the war being over, the USS West Virginia was headed for home. She was moored an Navy Pier at San Diego. I'm proud to say that my dad is in the picture of the ship and her fine crew, taken at Navy Pier on Oct. 23, 1945. He then made one more trip back to Pearl Harbor to provide the "Magic Carpet Ride" for troops headed back to the USA. 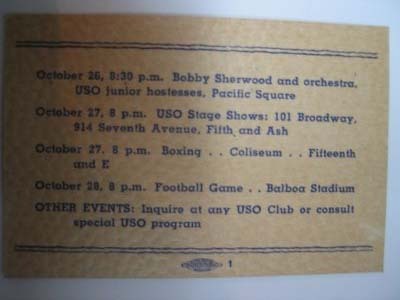 The ship arrived back in the States on 11-13-45. Dad was honorably discharged for the Navy on Jan. 6, 1946. He headed home and raised his three children, Mike, Chuck, and Jane. He passed away on Aug. 8, 1969. In the two photos below, Mitchell Cieliesz is on the left with his longtime friend Walter Skorzak.